Note: This is part of an ongoing series evaluating C.S. Lewis’ Mere Christianity.Part 1. Part 2. Part 3. Book 2 of Mere Christianity is titled, "What Christians Believe." This is problematic on many levels because no one, anywhere, at any time can say definitively what all Christians believe. One can, of course, say what they think all Christians should believe but that holds no water for me and shouldn't for anyone else coming from a free church tradition. Lewis is guilty of what we are all guilty of at one time or another. We over generalize and project our own beliefs onto the larger body of Christian believers around the world, forgetting that we are limited in scope by time, space, and culture. Thus, I am opposed to the heart of book two mainly because he attempts to make statements about what all Christians believe or at least what he thinks they should believe. The main text I want to zero in on is one that has gained popularity over the years and has been used as an argument for Jesus' divinity (among other things) by Christians from all stripes of Christianity. I am trying here to prevent anyone saying the really foolish thing that people often say about Him: 'I'm ready to accept Jesus as a great moral teacher, but I don't accept His claim to be God.' That is the one thing we must not say. A man who was merely a man and said the sort of things Jesus said would not be a great moral teacher. He would either by a lunatic - on a level with the man who says he is a poached egg - or else he would be the Devil of Hell. You must make your choice. Either this man was, and is, the Son of God: or else a madman or something worse. You can shut Him up for a fool, you can spit at Him and kill him as a demon; or you can fall at His feet and call Him Lord and God. But let us not come with any patronising nonsense about His being a great human teacher. He has not left that open to us. He did not intend to. First, Lewis says "a man who was merely a man and said the sort of things Jesus said" but does not offer specific examples to which he is referring? It can be assumed from the context that he is referring to verses where Jesus is attributed as claiming to be divine, but that cannot be known for certain. Second, Lewis betrays his cultural bias in his insistence on a strict "either or." Many people's faith (mine included) is not as black and white as Lewis makes it out to be. I used to be very rigid and black and white. I was searching for - and bold enough to think I had found - Absolute Truth. Further, Lewis offers us the options. He has set up a straw man argument so that no one would be able to refute his claim that Jesus was in fact the Son of God and thereby could not be anything else. Third, Lewis makes an assumption with which I fundamentally disagree. He assumes that everything he has read in the New Testament as being a quote from Jesus is actually a quote from Jesus. The idea the Lewis seems to have in mind, and that far too many Christians today have in mind, is that the disciples were following Jesus around with a pen and paper writing down everything he said and did. That could not be further from the truth. The earliest gospels were written almost and entire generation after Jesus died and were likely written because the imminence of his return was fading in the minds of his followers. Further, each gospel has very unique characteristics and likely were written with specific communities in mind, hoping to highlight certain aspects of Jesus and diminish or leave out completely other aspects. Thus, some stories were copied in multiple texts while others were chosen by some authors and not others. Still other stories were new creations (the woman caught in adultery in John 8, for instance). The fact of the matter is that for many statements attributed to Jesus there is little certainty of their accuracy, what with the agendas that the various authors had and the multiple revisions that each text most certainly went through (at the oral and written level). You must make your choice. Either this man was, and is, the Son of God: or else a madman or something worse. Not even the earliest followers of Jesus viewed the choice this harshly. The early years is typically described as "early Christianity," but it is more accurate to speak of "early christianities." For there were numerous early groups that claimed to follow Jesus and his teachings. These groups represented great varieties in beliefs and practices that ran the gamut from Jesus was a great human, but only a human, to Jesus was solely divine and only appeared to be human, and just about every conceivable point between the two. I reject Lewis' false dichotomy and am much lower on the "christology ladder" than it appears Lewis is. 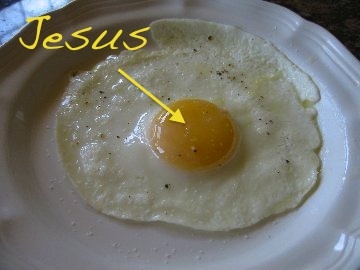 I guess that means that Jesus is a poached egg. That's just fine with me. I like my Jesus delicious.